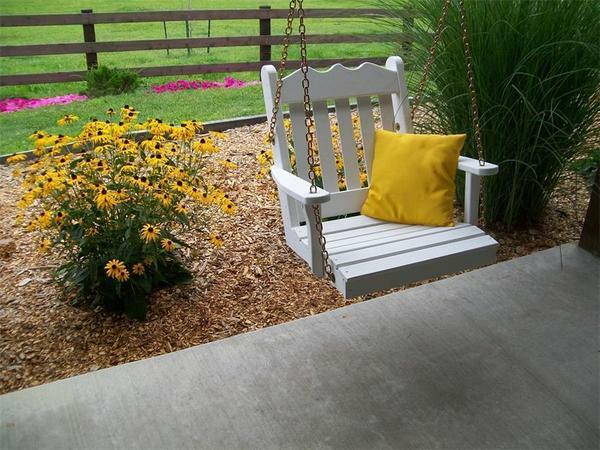 Get outside for some time to unwind with an Amish Yellow Pine Royal English Chair Swing to add some fun! Let the relaxing motion of this swing seat bring you the comfort you're looking for. The wavy top chair rail is sculpted and shaped to form an attractive design, while the arm rests are wide and accommodating. Handcrafted from untreated American grown knot free southern yellow pine wood, this outdoor swing offers durability along with comfort. All of our Amish made furniture is built to be strong and beautiful to serve families well. We offer pine in the stain or paint of your choice. Pick from a wide variety of options. We are happy to provide samples for you to consider. Set the scene on your front porch or set up this Royal English Chair Swing on the garden tree you love so much. Furniture made for family is a specialty of our Amish woodworkers. Take a look at more of our outdoor wood furniture from the Amish Garden Furniture Collection. We are here to answer all of your questions. Call an Amish Furniture Specialist today, toll-free at 866-272-6773.